Five years later …. Rachel Sutton-Spence took her ideas from the first Signing Hands Across the Water festival in the USA first to South Africa (2014) with Michiko Kaneko and then to Brazil for a festival in 2016, with her colleague Fernanda Machado. The format of this Brazilian festival also concentrated on performance, discussion and practical workshops, using the same format in both earlier events. This time the guest performers were from South Africa, Brazil, the USA, UK and Sweden. The festival sold out all the available workshops and events, nearly all deaf participants. 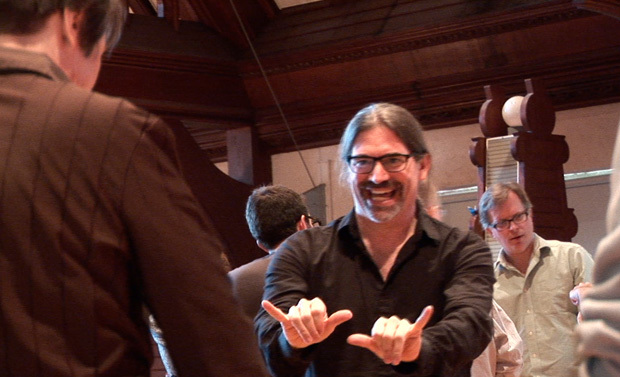 Martin Haswell’s film, Festival de Folklore Surdo: O filme condenses those four days right down into a few minutes. There is audio in Brazilian Portuguese and subtitles in English and French, so click the CC button and choose the language if you want to watch with subtitles. After the visit of the Flying Words Project and Debbie Rennie to Swarthmore College last week, it’s worth mentioning Miriam Lerner and Don Feigel’s film ‘The Heart of the Hydrogen Jukebox’ which celebrates American Sign Language poetry and traces its development. Kenny Lerner referred to the film and showed some clips from it in his own workshop on Saturday. There are interviews with poets and clips of historic poetry performances from Robert Panara, Bernard Bragg, Dorothy Miles, Patrick Graybill, Ella Mae Lentz, Clayton Valli, Peter Cook, Jim Cohn, Allen Ginsberg, and Debbie Rennie. The film’s title comes from Allen Ginsberg’s poem ‘Howl‘, which Ginsberg performed at NTID in February 1984. The poet Patrick Graybill, who was in the audience, asked Ginsberg what he meant by the word ‘hydrogen’ in the line ‘listening to the crack of doom on the hydrogen jukebox’. Peter Cook was in that audience, too. 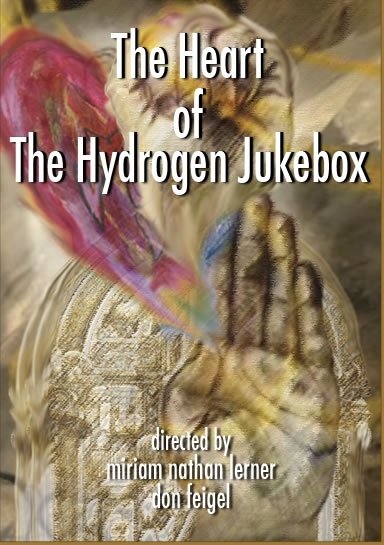 If you’re in Seattle next month for the Seattle Deaf Film Festival 2012, then you can also watch ‘The Heart of the Hydrogen Jukebox’ there, as it’s been chosen to close the Festival on Sunday April 1st. The DVD is also available from NTID at Rochester Institute of Technology here.